Wild: Appearing as something of a half-duck-half-dinosaur, Hesperornis is a medium-sized fish-eating bird, common in the rivers and lakes of the island. It would be about two-thirds the height of a human, if it stood tall, but it rarely does. Hesperornis spends most of its time gliding along the surface of the water, where it is much more maneuverable. Domesticated: Not particularly useful for hunting, and not being affectionate, Hesperornis is primarily kept for the specialized eggs it produces. When rendered correctly, the eggs separate into two distinct substances: One is a protein substance high in calories, and the other is an oily liquid that is effectively the same as the Oil found in the ocean! 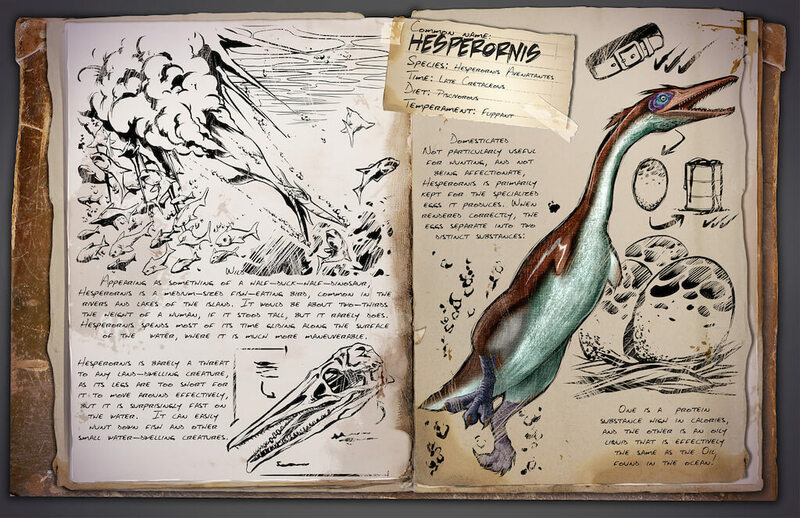 Known Information: Hesperornis is barely a threat to any land-dwelling creature, as its legs are too short for it to move around effectively, but it is surprisingly fast on the water. It can easily hunt down fish and other small water-dwelling creatures.